OTTAWA – Housing starts continued to decline in September by all three measures used by Canada Mortgage & Housing Corporation (CMHC). 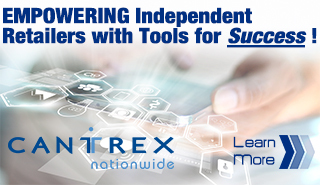 The trend fell 2.9% from 213,966 units in August to 207,768 units last month. The trend measure is a six-month moving average of the monthly seasonally adjusted annual rates (SAAR) of housing starts. Its used as a complement to the monthly SAAR to account for frequent swings in the estimates, which are driven by the multi-unit segment that often varies significantly from one month to the next. Housing starts also fell on the seasonally adjusted and actual basis as well. The standalone monthly SAAR of housing starts for all areas in Canada was 188,683 units in September, down 5.1% from 198,843 units in August. The SAAR of urban starts decreased by 5.9% in September to 175,653 units. Multiple urban starts decreased by 8.9% to 122,656 units in September while single-detached urban starts increased by 2.0% to 52,997 units. CMHC classifies urban starts as those in town and cities with populations of 10,000 or higher. Actual starts of single-family homes fell to 5,025 units in September 2018 from 6,351 units in September 2017 – a 21% drop. The decline was felt in every region of the country except Quebec, where they were essentially flat on a year-over-year basis. Starts in this category were down 24% in Ontario and 20% in British Columbia. For the first nine months of the year, single family starts were down 14% to 41,352 units – compared to 47,925 units or the comparable 2017 units. Starts were down in all regions example Atlantic Canada, where they gained 7%. The decline ranges from 9% in B.C. to 19% in Ontario. Meanwhile, multi-unit starts – which covers apartments, townhouses and other forms of linked housing for both the rental and condominium markets – fell 6% in September to 11,710 units. They were down 37% in B.C. and 19% in Quebec but up 21% on Ontario, further evidence of the regional volatility in Canada’s national housing market. Multi-unit starts, however, stayed positive for the year-to-date, gaining 4% to reach a preliminary count of 102,868 units. They are up in every region of the country, except the Prairies where they slipped a slight 1%. Leading was the Atlantic region, where starts for the first three quarters of 2018 were up 8%, followed by Ontario which was up 6%. Total starts for September were pegged at a preliminary 16,735 units – down 11% from September 2017. B.C. starts fell 31% while those in Quebec were off 16%. Only Ontario saw an uptick on a year-over-basis. For the year-to-date, CMHC estimated total actual starts at 144,220 units which is down 2% from the comparable period. Starts were off in every region of the country, expect B.C. where they were essentially flat. 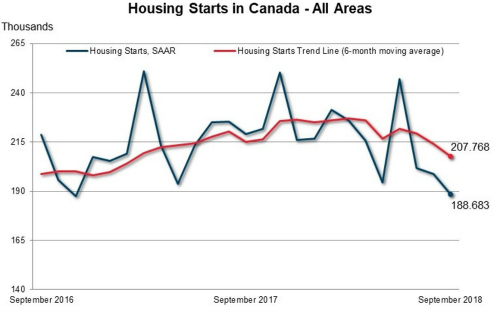 In his research note, Rishi Sondhi of TD Economics expressed some surprise at CMHC’s report as forecasts were previously calling for an uptick in housing starts in September.